Hello there, dreamers! Currently I’m flying high in the sky on route to the Newark airport with the biggest coffee I could find in hand. 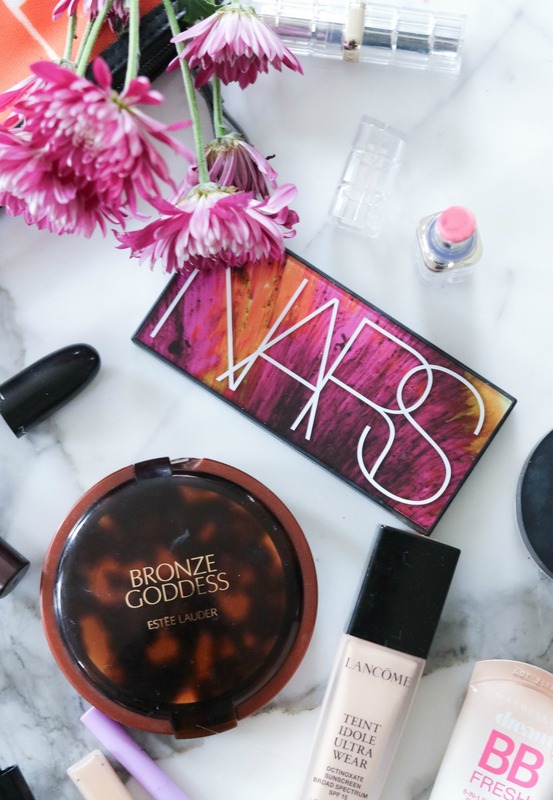 So, it seems like the perfect time to have a lil’ chat about the contents of my spring travel makeup bag. Last fall, this post on my fall travel makeup bag received loads of views – so it would seem you’re every bit as keen as I am to learn what people pack to look pulled together while on the move. The beauty of it is you can guarantee these products work. When traveling, no one wants to fuss around with a mediocre foundation or subpar mascara. We’re all working with limited suitcase space and frankly there’s just no room for duds so you KNOW the goodies inside a travel makeup bag are, in fact, actually goodies. If I’m being totally honest: I’m rubbish when it comes to packing clothes. No matter how hard I try, I always manage to over-pack and find myself *cringing* a bit when weighing my suitcase at the airport. Makeup, however? That’s where I excel. On this trip, I’ll be gallivanting around NYC and northeast New Jersey, so while I’ll definitely be in a coastal area…it’s by no means a beach vacation. As such, I knew I’d want a full face of makeup at my fingertips. When I’m lounging by the pool or the beach? Not so much. When going to Broadway and The Wendy Williams Show? YES! By all means, give me all the makeup please. I started packing by sitting down at my vanity and gathering all those tried-and-true products that never fail me. So, inside my bag you will find a do-it-all foundation, the best hidden gem mascara from the drugstore, a classic lipstick I will always go back to and my new favorite travel palette from NARS. Spring travel makeup bag secured? Check! 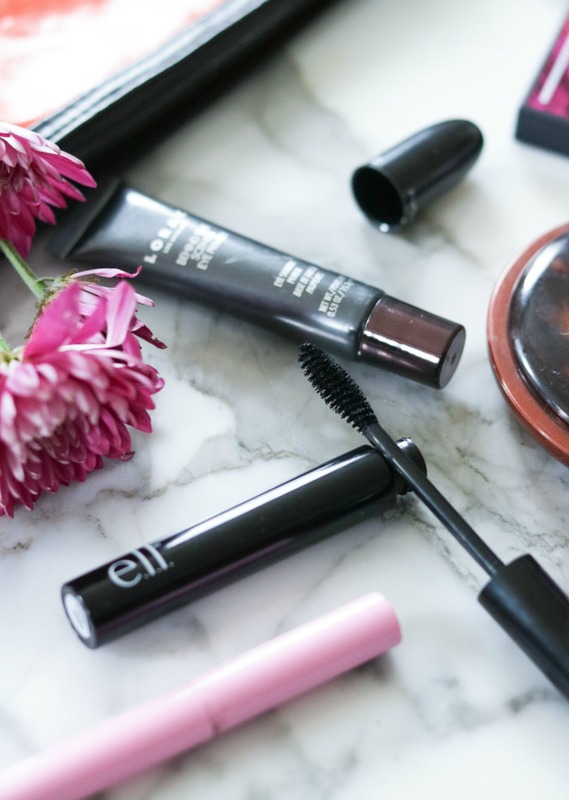 What better place to start this spring travel makeup roundup than with a miracle mascara that costs only $3. Yes, you read that correctly: THREE BUCKS. Ever since discovering this last year I’m such a skeptic at any new mascara that hits the market because really, do I need another when I have this guy? It separates and lengthens my lashes like none other, doesn’t flake or smudge and even outlasts intense water aerobic classes. If you haven’t tried this yet, I promise you will not be disappointed. Obviously it would be insane to go on vacation without something for the brows. When I couldn’t decide between my favorite Lime Crime brow duo, I went ahead and packed them both. This one has the same design as a slim liquid eyeliner pen and allows you to fill in your brows in a matter of seconds. Another brow product from Lime Crime that I love? Their brow gel! 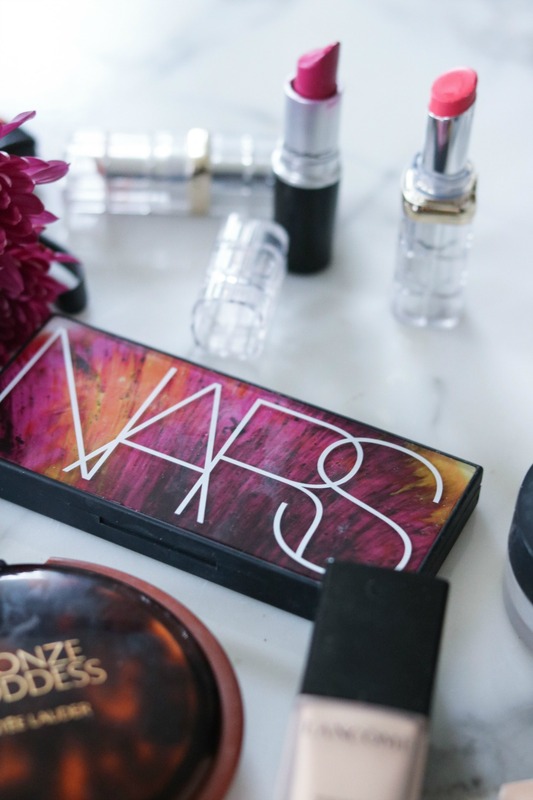 This is one I love so much I actually included it on my list of Most Underrated Makeup products back in January. A lot of times I feel like spool-y brushes for the brows can be a bit overwhelming when you get towards the tail, but this one’s slim design gives you a lot of control. On the concealer front, I seem to bounce back and forth between this and the NYX HD concealer (which is a NARS concealer dupe, btw.) Currently? I’m feeling Maybelline’s. The Fit Me concealer applies so smoothly, has great coverage and it doesn’t crease or settle oddly into my pores. (The Worst!!) Essentially, it’s such a foolproof product I feel like I could apply it easily in the dark with no mirror and have zero issues. 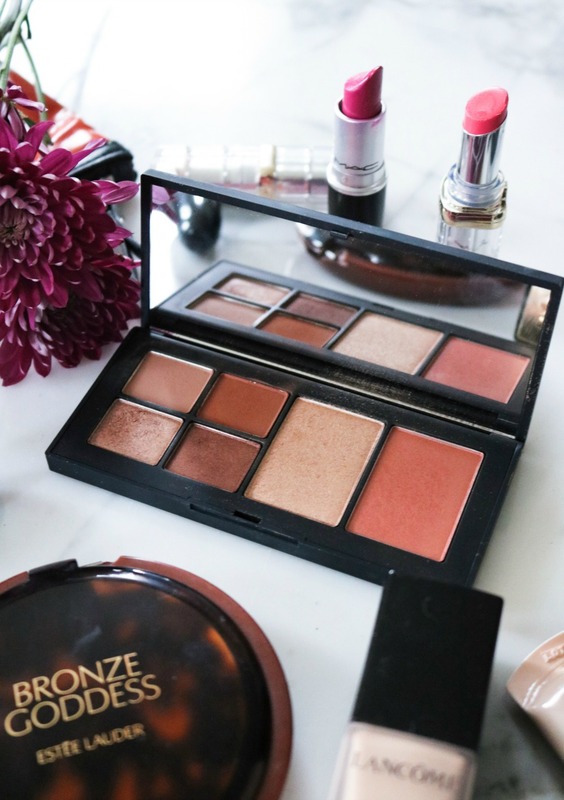 I swear, I might be using this SAME Bronze Goddess from Estee Lauder till I die. Okay, that’s definitely an exaggeration but seriously? This rather large beauty is lasting me forever. 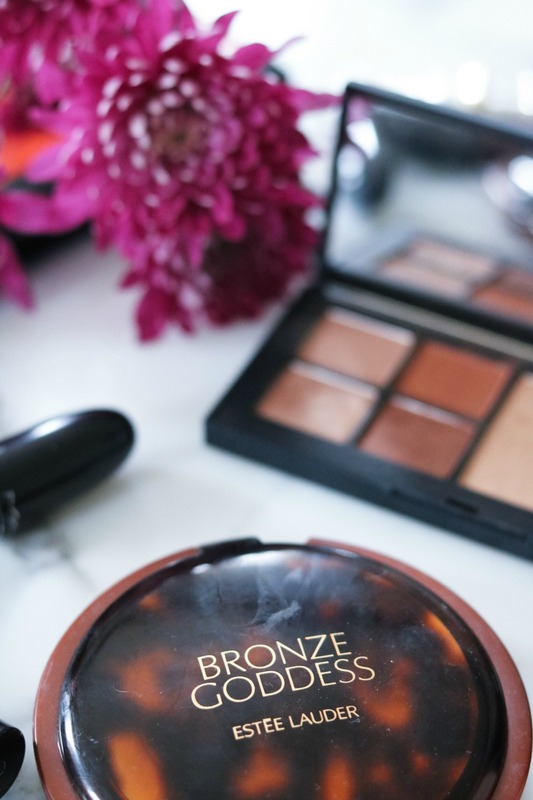 If you’re not yet familiar, Bronze Goddess is a beautiful matte bronzer and comes in four shade variations to work with your skintone. 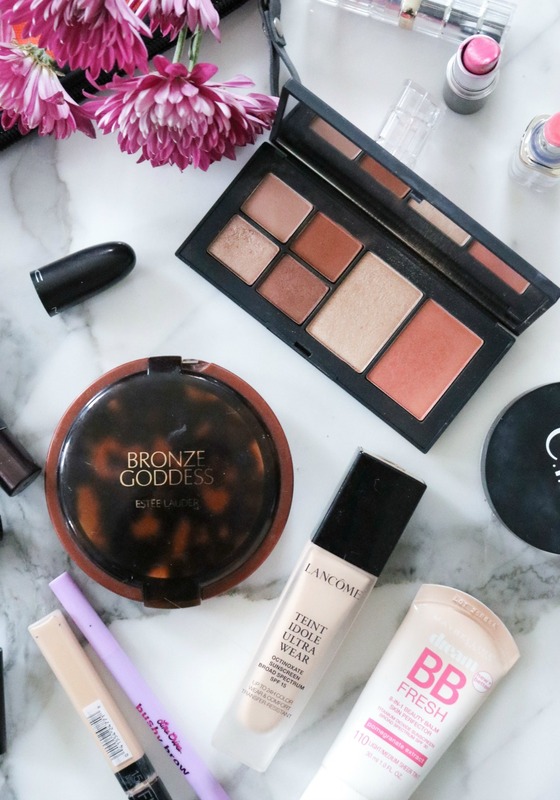 As it’s my most-used bronzer it makes sense that it landed in my spring travel makeup bag…but I predict I’ll also be toting this around in the summer, fall and so on. Quality product alert! When traveling, I’m all about efficiency and so compact palettes are my friend. When I spied this on the Nordstrom website I just had to get my hands on it. For one, I’m a sucker for a classic eyeshadow quad. Secondly? 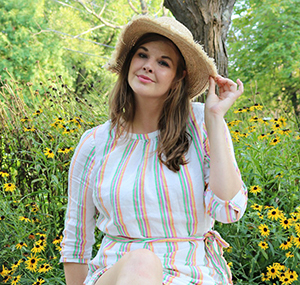 The blush is threaded with gold and the thought of cheerful springy cheeks was too appealing to ignore. To help you learn more about the palette, I actually did share a full review with swatches, here. Truly, I don’t understand why more folks aren’t just raving on and on about how great this Lancôme foundation is…because it’s flawless. It’s one of the most reliable products I’ve ever gotten my hands on and will give you all-day coverage that’s virtually weightless. A 5 star product if there ever was one! When the confirmation email came in for my tickets to The Wendy Williams show, I knew I’d want to go with a really fun lipstick. With that in mind, I honestly don’t think there’s a better place to turn than MAC’s classic “Girl About Town” lipstick. It’s from the Amplified range, has a satin finish and is impossibly long lasting. 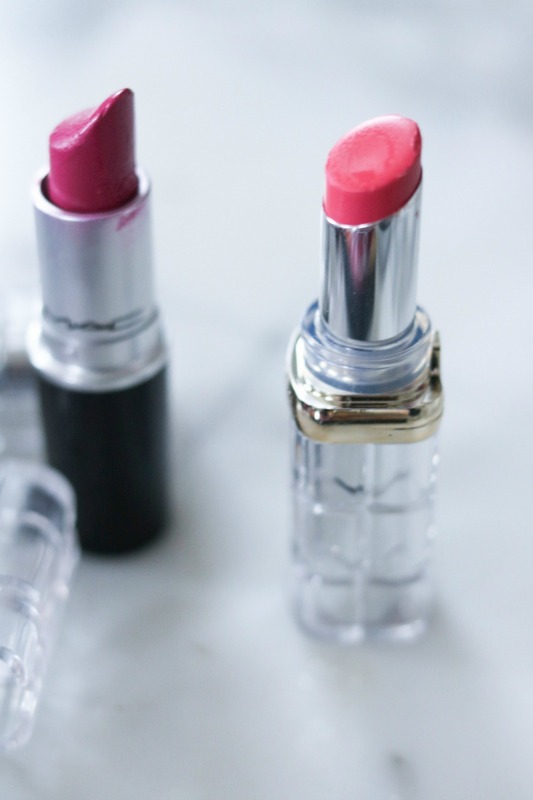 It’s a spot on perfect lipstick essentially and one I will always, always go back to. On the days where I want more shiny coverage on my lips, I’m going with the L’Oreal Colour Riche Shine lippies. 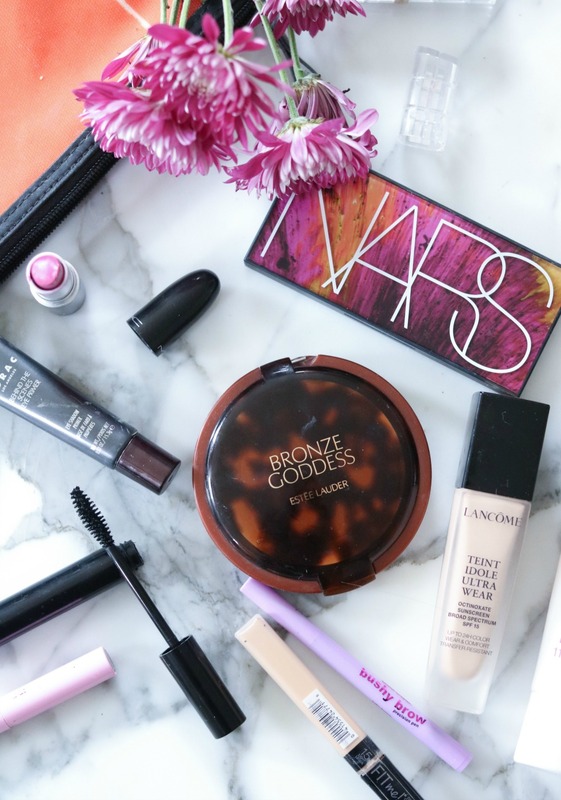 In my spring travel makeup bag, I actually opted for two…because why limit perfection? With me I have Luminous Coral and Polished Tango and I look forward to wearing these all spring long! A go-to staple in my makeup routine every single day? Lorac’s Behind-the-Scene eyeshadow primer. This prolongs the wear time of any shadow and also neutralizes your lid space so you can build off a fresh canvas. At this point, I think I’ve probably gone through about ten of these and I show absolutely no sign of slowing down! 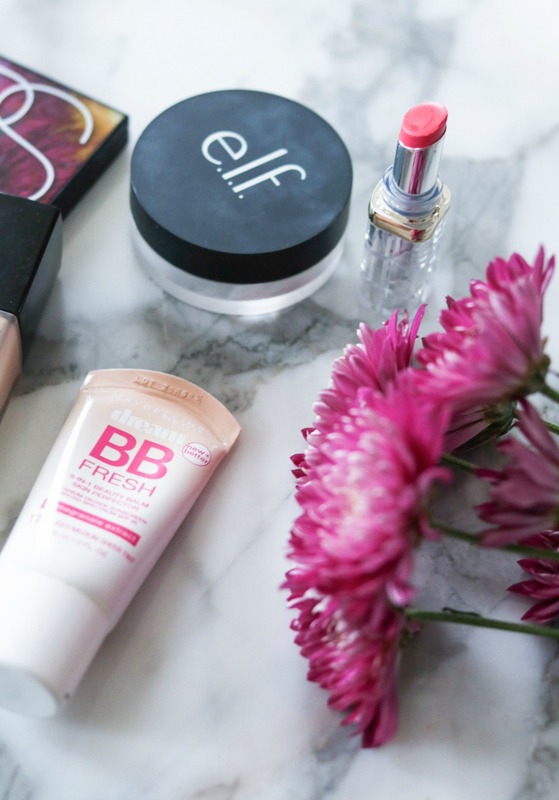 If you’ve been around here before, you may recall that I have big love for ELF’s HD translucent powder…and so it’s not really all that surprising to see it land in my spring travel makeup bag. But seriously, I can’t go without it. It performs every bit as well as Laura Mercier’s setting powder, but at a much more attractive price. 6 BUCKS! Last but not least? Maybelline’s BB Cream. I love the Lancome foundation so much, but on days I want to give my skin a little bit of a break I turn to this guy. For one, it has an SPF so has me covered there. It’s also my secret for perfecting those “no makeup” makeup days. Well, there you have it. The contents of my spring travel makeup bag — and also a round-up of some of my favorite go-to products if you prefer to look at it that way. If you’d like to see what I get up to on my trip, be sure to give me a follow on Instagram where I’ll no doubt be posting A LOT to my story. Outside of my plans to see Wicked and my queen Wendy Williams, I actually don’t have anything set in stone which is incredibly exciting! Usually when I’m in the New York area it’s for fashion week…so having the freedom to do whatever I want whenever I want is going to be a lot of fun.